Affordable, easy-to-use, and flexible transportation options are vital to older adults' quality of life. Community Mobility: Driving and Transportation Alternatives for Older Persons provides physical and occupational therapists with recent research findings on older driver assessment, remediation/rehabilitation, and the use of alternatives to the car in the event that older adults need to “retire” from driving. This unique book addresses changes in driving patterns over time, the impact of climate conditions on driving, mental and physical health issues, self-regulation by drivers, and driver safety. Community Mobility addresses changes in driving patterns over time, the impact of climate conditions on driving, mental and physical health issues, self-regulation by drivers, and driver safety. This unique book also includes summaries of recent consensus conferences held in the United States and Canada to determine the best approaches to therapist services and counseling. 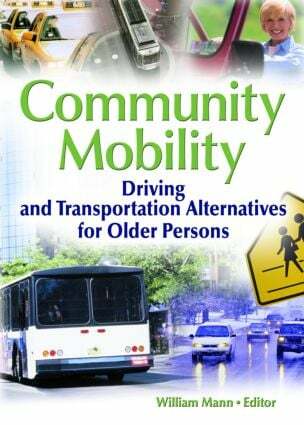 Community Mobility is an essential resource for anyone working with elderly drivers who face the loss of independence and the decreased access to social activities, medical services, and other basic needs that accompany “retirement” from the driver’s seat.